Welcome to this weeks newsletter. Its been an eventful week for Callum, firstly he signs his contract with the PGA to begin his training to become a fully qualified PGA Professional. Then whilst out playing he had a hole in one on the 10th using one of his new Wilson FG Tour wedges given to him by Wilson. Callum will play the Wilson Staff V6 irons, Wilson FG Tour wedges carried in an Exo stand bag. He will also use the new Duo Professional ball and wear a Tour leather glove. Call in and ask about the new Wilson range, top of the range equipment and fantastic value for money. 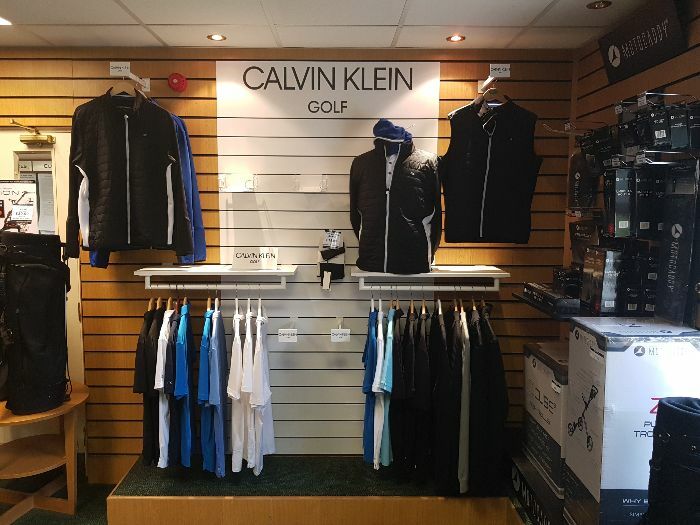 Next week sees our 2019 Calvin Klein stock arriving. To prepare Calvin Klein's sales representative called in to get the wall ready for the new collection landing. 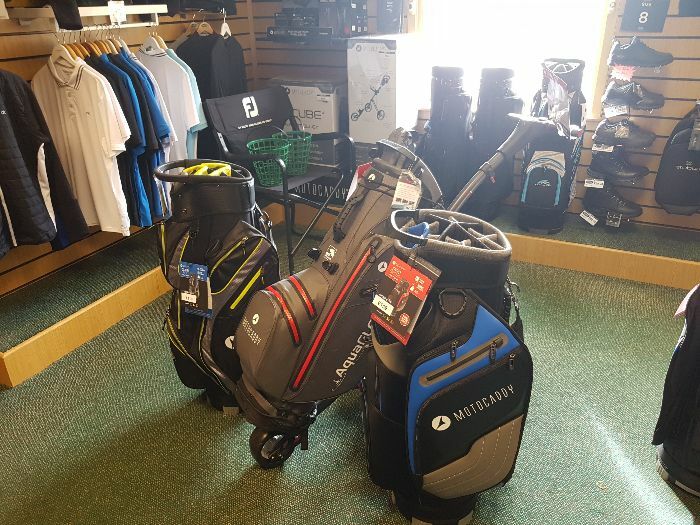 We now have stock of the new 2019 Motocaddy bag range. The range includes the Dry Series bag, the Pro Series bag, and the Club & Lite bags. New for this years is the new Aquaflex Hybrid bag. The Aquaflex is a very versatile bag that is not only 100% waterproof but acts extremely well both as a carry bag and a cart bag.. The bag sits very securely on most trolleys with stand locks to keep the stand in place. It also has quick release straps to change quickly and easily. Can new grips give you more distance? Sounds like a great marketing question by one of the grip manufacturers doesn't it? 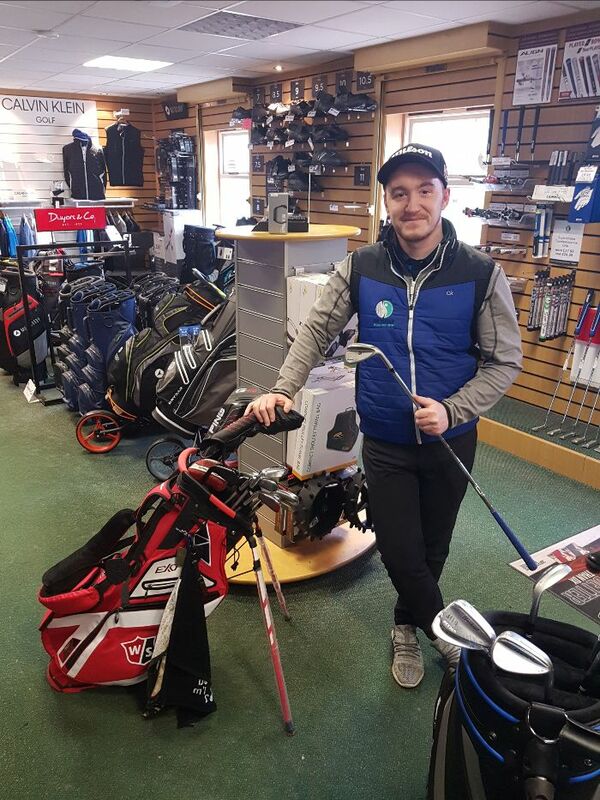 Today we regripped Shaun Greenwood's clubs with the new Golf Pride CP2 grips and after his round called in the shop to ask why he's just it all his clubs around 10 yards further! Sounds impossible? Absolutely not! When talking to Shaun on why this could happen, I explained that when a grip is only slightly worn or slippy, the natural reaction is to hold the club a little tighter. This tightness causes tension, this can then cause a serious loss of clubhead speed and control during your swing. If your unsure about your grips, or would like some advice, please call in and have a chat. The Duo Professional is a new ball for 2019 from Wilson. The ball is a 3 piece ball with a Urethane cover (same material used on the Pro V1). The ball is 60 compression, making it lower than any 3 piece ball on the market and according to Wilson the worlds softest rethane golf ball. All this for only £29.99 a dozen , around £10 cheaper than other premium balls on the market! 3 members took the ball out for the first time this afternoon and all 3 gave very positive reviews of the ball. They all seemed suprised how far the ball travelled for a premium ball and the stability of the ball in the wind.